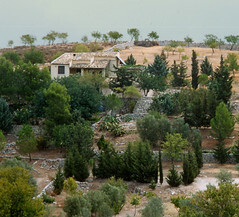 Case Caro Carrubo -the cottages of the lovely carob tree- are situated in the hills of Mt. Iblei in southern Sicily, located in the province of Ragusa. It is not far from the city of Comiso and only 30km from the seaside. The place takes its name from a giant carob tree which can be seen from afar upon arrival. Purchased in 1992, it consists of 4 hectares of countryside featuring rural cottages renovated for guests and also a permanent residence. More than one thousand trees dot the landscape—including almond and olive tree groves—bringing life back to the land. Case Caro Carrubo is a lush, green oasis amongst the mostly barren hills. In the past and still today Sicily suffers from people abandoning the countryside and emigrating elsewhere. Protecting these areas and stopping them from disappearing has been and remains an important practice. Case Caro Carrubo works towards this goal. Sustainable tourism can help these disadvantaged places in the countryside by rejuvenating them with value and respect while sustaining those who live there. We are interested in renewable energy and various ecological practices tied to a healthy economy, in the care of the earth and ourselves. Lights and hot water are provided by solar energy. The land is cultivated organically. Fire, water, air and earth: these are the basic elements of life. However today (especially in the city) it is difficult to keep in contact with these essential elements. Case Caro Carrubo is rich with these elements and we are more than happy to share these with all of our guests. Above all we like to offer children these basic but essential experiences. The space that surrounds us, without the danger of roads and cars, is vast and invites exploration. Apart from people interested in vacations we also offer meals and accommodation in exchange for manual labour for those who would like to find out more about Case Caro Carrubo. Benvenuti in Sicilia – All are welcome!